1. Preheat the oven to 500 and place a rack in the lowest slot in the oven. Line a baking sheet with parchment. 2. Peel the butternut squash, cut in half lengthwise and remove the seeds. Cut each squash half in half widthwise, right where the slender part curves out to the bulge. Cut each quarter into about 1 inch wedges (see picture) and place in a bowl. 3. Toss squash with olive oil, sugar, salt, and cayenne. Place in a single layer on baking sheet. 5. Remove from oven and flip over. Bake another 10 to 15 minutes until caramelized on the other side and cooked through. The pieces on the edges of the baking sheet will caramelize first so you want to move around during the baking time. 6. While the squash is roasting, make the pesto: Warm 3 tablespoons olive oil, sage, and garlic in a small pan over very low heat just until the oil bubbles. Pour in a small bowl, reserving the garlic clove. 7. Place the toasted hazelnuts in mini food processor along with the garlic clove and process until a fine crumble and add to the bowl (alternatively, you can do by hand or in a mortar and pestle). 8. Add the cheese to the bowl along with 1 to 2 tablespoons more olive oil and stir until combined and salt to taste. This is not a traditional pesto — more nutty than herby and not so much oil. 9. 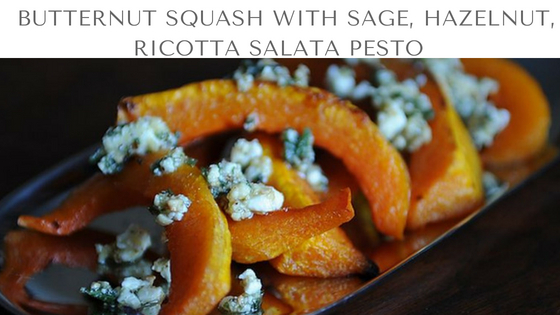 Once the squash is roasted, place in a large bowl and toss with pesto to taste. Dig in.